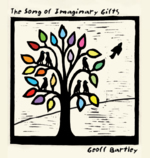 All of Geoff's full length CDs are available right here. You can order physical CDs or download digital files of complete albums or individual tracks. including track list, production information, liner notes and links to reviews. to hear all the other instruments . . . a little trick I learned from Tom Paxton.